Book Review: Put ’em Up! 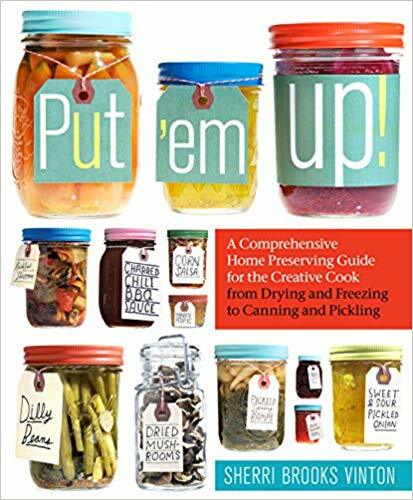 Put ‘em Up’s subtitle is “A Comprehensive Home Preserving Guide for the Creative Cook from Drying and Freezing to Canning and Pickling.” It’s a mouthful, but it sums up beautifully the ambitious task Vinton undertakes with clarity, good humor and an inspiring “you-can-do-it” tone. It’s one of several books that have been issued or re-issued recently to address the increasing interest in vegetable gardening and simple living among young people. In the book’s introduction, Vinton acknowledges that canning seems to have skipped a generation. Many of the book’s readers may have memories of grandma canning, but none of their mother or father preserving food. These are skills we do not want to lose as a society, Vinton says, and she aims to give new or young canners confidence as well as information. Like other food preservation books, Vinton begins by offering some safety warnings and going through the basic types of food preparations for preserving and food preservation options, including pickling, jamming, drying, freezing and boiling water bath canning. She does not address pressure canning, which is a more advanced skill and probably not one that beginning food preservers are likely to tackle. One thing I really liked about this book is the way Vinton addressed the warnings, which have kept many beginning gardeners from doing a lot of preserving. She lists clearly and succinctly “Signs of Good Food Gone Bad,” as well as “Things that Look Bad, but Aren’t Dangerous.” Read the front section carefully, and you will be able to can with confidence. Beyond the introductory chapters – about one-third of this well-illustrated and designed volume – you will find pages of creative recipes for everything from rhubarb soda syrup to carmelized onion confit. I was thrilled to see a recipe for roasted red pepper ketchup, which I tried, and liked, even having used end-of-season tomatoes and grocery store peppers. It was a little chunky, but rich and flavorful, not just sweet – great on fries or a burger. Next September when the ingredients are at their peak, I’ll be making more of this. I bought Canning for a New Generation at that great cooking store in Northfield this summer while visiting my sister–I LOVE that book and will probably check out Put’Em Up as well. I made a few things out of the former this fall and thought they were fabulous. Loving your book reviews! Thanks, Sandi! The Measuring Cup is a great store. I’ll have to look at Canning for a New Generation more closely.